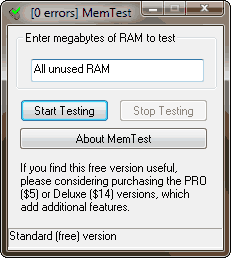 At Sysnative.com one of the Moderators who is helping an AMD Forum User recommended this software to test his new RAM Memory sticks since MEMTEST86 is showing them to be good. Testing my RAM with MEMTEST to see how it works. 3) Started MEMTEST eight times and inputted all eight MEMTEST screens with 1675 and started testing. 4) Running 8 instances of MEMTEST. Ran each core from 100.6% to 112.4% without any errors while browsing the internet. 5) computer runs very slow due to the stress put on CPU and RAM Memory while testing. Note: make sure you have a good CPU cooler. My CPU is running at 100% but with my Cooler Master 212 EVO CPU temp is stable at 52 c.